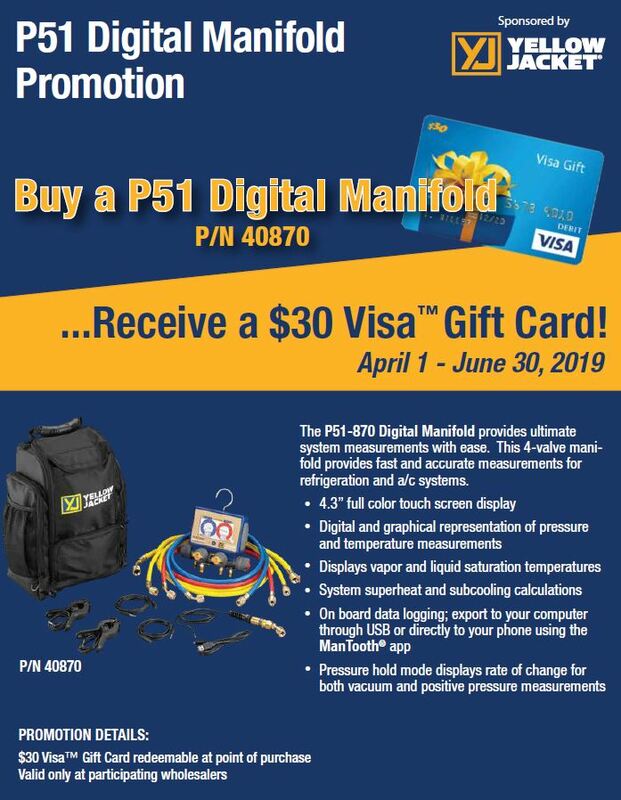 Yellow Jacket P51 Promotion, while supplies last ! The YELLOW JACKET® P51 TITAN™ Digital Manifold Series provides ultimate system measurements with ease. This 4-valve manifold provides fast and accurate measurements for refrigeration and a/c systems. Measurements are displayed on a backlit digital display and can be transmitted via Bluetooth® to a Smartphone for even further analysis. Local display of system pressures and temperatures, superheat and subcool provide instant analysis. When connected to your Smartphone, target superheat and subcool are easily attained, along with all the other capabilities of the ManTooth™ app. The flagship YELLOW JACKET P51-870 TITAN features a 4.3” full color touchscreen graphic display with digital and graphical representation of pressure and temperature measurements. It also features on-board data logging and standard vacuum sensor and measurements (vacuum sensor included). A 4-pak of hoses is included as well as two temperature clamps and a backpack carrying case for safe storage. 126 refrigerant profiles stored in the instrument including new blends not currently on the Refprop database. A great new tool to make your job easier. The Rite Site Inspection Mirror presents a true NON-INVERTED image making it a must for every technician, engineer or hobbyist. Optical quality glass prism (not plastic) encapsulated in a shock resistant plastic housing. Multiple joints allow you to get into the toughest spots. Easy to See and Read! Avoid Costly Mistakes!